With its handsome decorative pattern based on the traditional Norwegian sweater, this small stove is the perfect space heater for cottages, camps & smaller living areas. 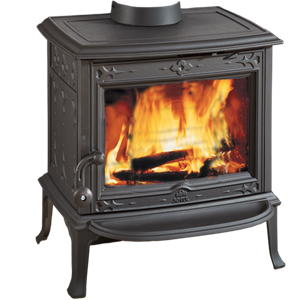 This powerful stove continues our tradition of design and innovation with the Jøtul Simplex™ clean burn technology, that optimizes fire viewing area, fuel loading convenience and combustion efficiency. Popular options include: fresh air kit, leg leveler kit, and long leg kit.